Welcome to the third edition of the highly praised game about the ruthless world of high fashion (nominated for the Polish Game of the year 2011, International Gamers Award – General Strategy: Multi-player, and Best Board Game at Origins Award)! Each player is a clothing magnate, and will clash with others in a brutal war for dominance and success of their brand. During the game players are opening new branches of their business, and hire new, talented employees to expand their capabilities. With each passing month you will gain new managers, models, and designers – your company will grow to eat your opponents alive! Prêt-à-porter is a game for 2 to 4 players, and provides an intense, competitive experience. Make yourself the king or queen of the fashion world! 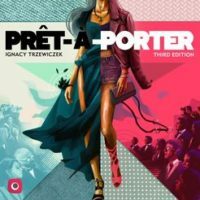 Prêt-à-porter third edition is coming to Kickstarter in 2019! This edition will have brand new components and a stunning artworks from an industry veteran Kwanchai Moriya (artist for Dinosaur Island, Catacombs, and Flipships). Add a Review for "Prêt-à-porter (3rd ed)"